All Auberry homes currently listed for sale in Auberry as of 04/18/2019 are shown below. You can change the search criteria at any time by pressing the 'Change Search' button below. If you have any questions or you would like more information about any Auberry homes for sale or other Auberry real estate, please contact us and one of our knowledgeable Auberry REALTORS® would be pleased to assist you. 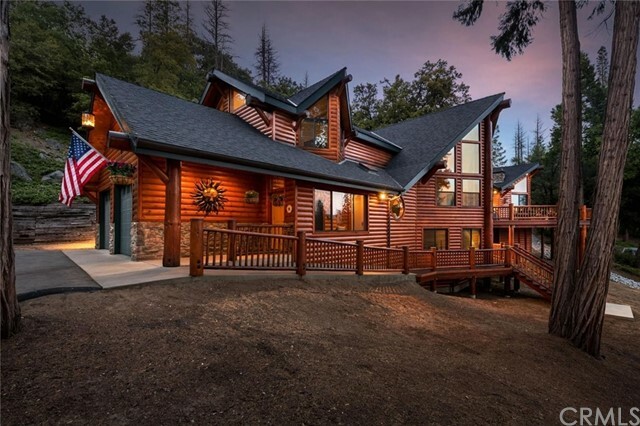 "This beautiful home combines mountain cabin design and modern luxury with distant mountain views on 10 quiet, private acres near Shaver Lake. The spacious great room with 22' cedar ceilings and log siding has room for large gatherings. The kitchen is brand new with knotty alder cabinetry; Italian granite; SS 48 commercial range, microwave drawer, refrigerator & dishwasher. The private, spacious master suite with propane stove, natural stone hearth, log ceiling treatments and luxurious bathroom is on the main level. A second master suite is upstairs and 2 large bedrooms and a full bath are downstairs. There is a half bath off the laundry room which has new cabinetry and granite. The loft over the great room is a great office or kids play room. The den is the TV room with a pressed metal & captains beam ceiling and propane stove with natural stone hearth. The deck with fire pit is large and perfect for BBQ's, sitting around the fire pit or playing corn hole. The hidden 750-bottle wine cellar has custom hickory racking, slate floors and is absolutely gorgeous. The attached garage fits large pickups. The shop has a 3/4 bath, 220 power & propane wall heater. The well was recently certified to produce 20+ GPM. Watch the video!"